Sweet tea fried chicken for two! I adore the month of February. I love to celebrate Valentine’s Day. The few days in February that remind us of impending Springtime are joyous. I’m a nut for Mardi Gras. But most of all, I love February because it’s my wedding anniversary. That’ll be one year, folks. Wow. It’s gone fast. As a couple who’s moved twice in 2 years, started 4 new jobs, and bought 2 houses, we haven’t had the most ordinary first year of marriage. We didn’t have a run-of-the-mill honeymoon, either. We got married in my hometown outside of Dallas, and then we drove all across the South. We stopped in New Orleans, Birmingham, Savannah, and Charleston. Even though Birmingham, Alabama was only our second stop, we were positive we ate the best fried chicken we will ever eat in our life. The name of the place is Saw’s Soul Kitchen. It was packed on a Friday afternoon with college professors, students, and locals enjoying down on grilled pimento cheese and fried chicken. To be exact: sweet tea fried chicken. My husband took one bite, rolled his eyes back in his head, and declared it to be the best ever. As people who have had the great pleasure of eating heaps of fried chicken in our lives, this was no small thing. It had a perfectly crisp crust that oozed sweet juice at each bite. We took breaks between bites only to moan. I found the place through a Southern Living recommendation, which incidentally proved to be the only reliable source for restaurant recs on the whole trip. This is my attempt to recreate the most perfect fried chicken. I brined the chicken for a full 2 days. I recommend putting the bird in the buttermilk and sweet tea mixture on Friday night. Then, fry it up on Sunday after Church. I’m no stranger to frying food. I love to fry. I love that it ties you to the stove and simultaneously draws everyone else around you. I believe frying skills to be a gift, one that can be learned but is best when it’s innate—much like athleticism. That said, this chicken is oven-fried. That does not mean it’s healthy or baked instead of fried. It is fried whilst in the oven. Many soul food joints swear by this technique to develop crispy crusts and moist meat. Needless to say, they are right. The technique is simple: the butter and oil melt in the skillet in a hot oven. The chicken is battered twice, and then placed in the already hot skillet. After 20 minutes, flip the bird. After the first turn, the chicken won’t appear to be dark enough, but it will darken further as the other side fries (check out the photo below). I used Moonshine sweet tea concentrate for my marinade, but if you can’t find it, just boil down 1.5 cups until you get ½ cup of sweet tea concentrate. For fried chicken that serves two, we generally use one chicken breast, with the tenderloin attached, that is chopped in half through the bone, plus 2-3 drumsticks. Use any combination of light and dark meat you like. In a medium bowl, add the chicken pieces. In a small glass, whisk together the buttermilk, sweet tea concentrate and 1 tablespoon of salt. Stir well to dissolve the salt. Pour this mixture over the chicken, cover, and marinate 48 hours. When ready to cook, preheat the oven to 425. When the oven is at 425, place the cast iron skillet on the center rack and let it heat for 10 minutes. Add the butter and oil. It should melt almost immediately and begin to sizzle. Place the pan back in the oven while you do the next step. Next, bread your chicken. Remove the pieces from the marinade, but reserve the marinade. Add the wet pieces of chicken to the flour mixture and use your hands to toss to coat each with flour. Then, repeat the process: back in the buttermilk-sweet tea marinade again and then flour to coat. You just double-battered your chicken. Next, carefully arrange the chicken pieces in the pan with the sizzling oil and butter. The chicken should immediately start sizzling and cooking. Return the pan to the oven and bake for 20 minutes. Flip the chicken, then bake for another 14-18 minutes. Test the chicken with a thermometer--it should read 165 in the thickest part of the meat and the juices should run clear. Immediately remove the chicken from the skillet and let cool for 10-15 minutes. Serve warm. Happy anniversary girl! I have moved 3 times in 1 year of marriage, so I know what a little craziness can be, so congrats! This fried chicken looks DIVINE! I love that you used sweet tea. My hubby is going to go mental over this! You are a rock star wife! Wow!! There is nothing quite like home made fried chicken! I love the brine!! This has to be the best fried chicken I’ve ever seen — sweet tea brine? I’m sold!!! Happy anniversary! I can’t believe how much you’ve packed into one year of marriage. I hope year two is a little bit quieter! 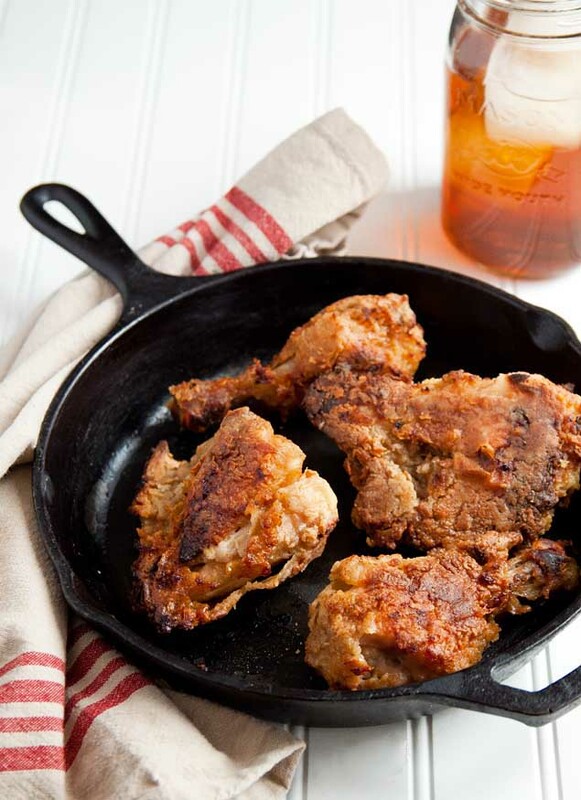 This fried chicken sounds totally epic especially with that sweet tea marinade. Happy Anniversary! This chicken looks like a great way to celebrate! Your honeymoon sounds fabulous… We’ve done the same thing since moving to the South, always in search of the “best” barbecue, fried chicken, po’ boys etc. There is soooo much good food to be found tucked away on southern back roads. Happy anniversary, sweetheart! I am on the lookout for that sweet tea concentrate, because whoa. I haven’t ever made fried chicken this way, but I’m intrigued. Dang gurrrrrl!! Will you come over and make me fried chicken?? Seriously, love this! And Happy Anniversary! This chicken sounds absolutely incredible! Congrats on one year! Happy Anniversary! These sounds oh so good I’m practically drooling! Oh lordy that chicken looks so amazing! It looks so crunchy, I need some in my life, like now! I hope you had a wonderful anniversary!! 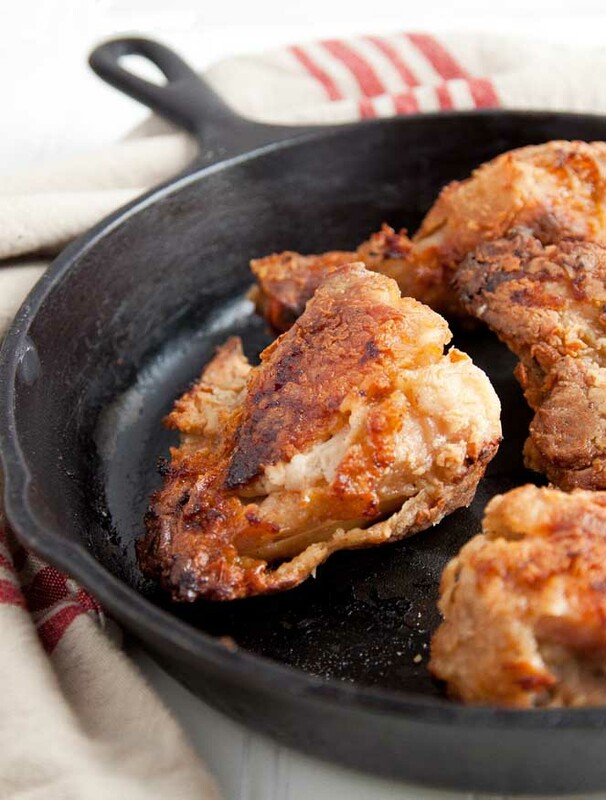 Sweet tea fried chicken sounds absolutely delicicous! I had some amazing fried chicken in Dallas last year (Sissy’s) and still think about it now. I love you. I will come over to your house any Sunday afternoon! Thanks for the lesson in fine southern living. Happy Anniversary!!! I love that you guys did a road trip through the deep south for you honeymoon. That is AWESOME! Taylor would fall in love with me all over again if I cooked up this chicken recipe (he eats meat) I may just have to go for it in the name of love! All you’ve done is remind me that I haven’t had fried chicken in a very long time and now I’m craving it bad. I know I do love it with honey so imagining that bit of sweetness in the brine can only mean good. YUM! And Happy Anniversary; here’s to a boring year (or at least not having to move again!). Happy Anniversary! This sounds incredible! Love the sweet tea brine! OMG sweet tea and fried chicken! Throw in some biscuits and call me an honorary southerner! Love it! Happy one year!!! This literally makes me want to weep. From the beauty of it AND from the fact that we aren’t even closer than we are for on-the-fly fried chicken nights. Also – Alex has this weird picky fried chicken thing. I have long held this theory that if anyone could make fried chicken that he would approve of, it would be you. This solidifies said theory. I want to learn how to make fried chicken!! And that is so fun to travel throughout the south! I defo want to to do that one day!! Happy Anniversary!! I love that you used sweet tea! I am so making this. 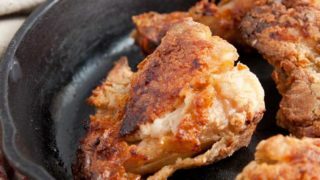 I’ve never actually fried chicken before (except wings, once, and I didn’t quite get them all done and then I died and swore off fried chicken), so this method sounds perfect! And the sweet tea? So fun! My family loves sweet tea! Uh, yum! I just went to a restaurant in New Orleans that served a sweet tea glazed chicken that was out of this world! Must try this! I love the color on this chicken! You make it seem so easy! Gotta try this soon. Wow! I’ve never heard of using tea in chicken brine. And the technique is interesting. Looks so delicious. Happy Anniversary! This chicken is lovely, I’m totally going to have to try this method! Happy belated anniversary!! Fried chicken is one of my favourite foods, and yours looks so crispy! Mmmm! Moonshine sweet tea is absolutely delicious! I definitely think folks should try to get your hands on it if they can! Oh, this looks fantastic and thanks for the recipe. I love fried chicken, but I don’t really have any of my own recipes for it. Happy anniversary girl!! :) What a busy first year it’s been for you! Whew!! ;) This chicken sounds like perfection!! I must try it out soon! ❤That fried chicken looks amazing… Gonna make this soon! Happy FIRST Anniversary!!! Hope you two lovebirds had a wonderful anniversary! My husband took me to Whole Foods and to Fresh Market looking for the Moonshine Sweet Tea Concentrate. We couldn’t find it anywhere!! So, I tried to make my own and we shall see how it goes! I have chicken “brine swimming” in my Fridge right now! It will be on our supper table this evening. Can’t wait – hope it turns out as good as your’s!! Christina!! It was incredibly delicious!! Will definitely make it again!! We don’t have any sweet tea concentrate here in Australia and you said to boil down 1-1/2 cups of ????? Do you mean honey? Can you please let me know what I could substitute for sweet tea concentrate. 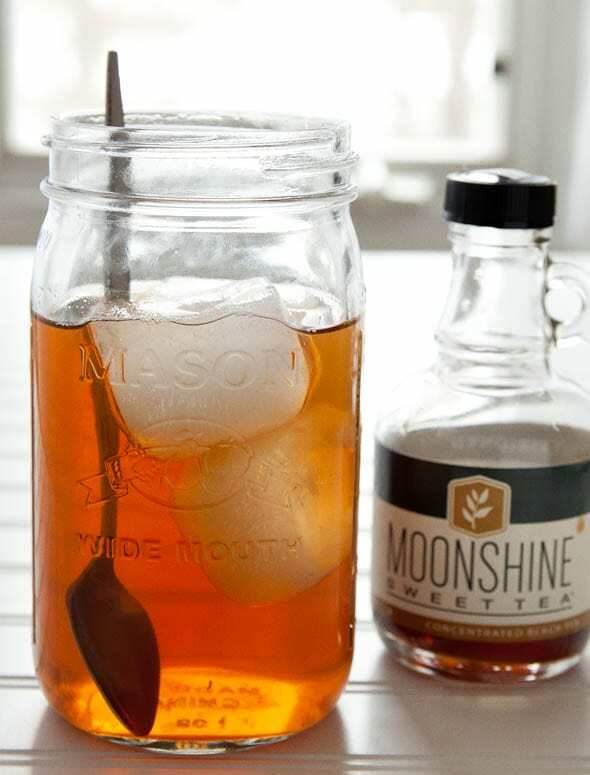 The brand of sweet tea concentrate that I used is called Moonshine. Check their site for details on where to buy. People have told me they ordered it on Amazon. I leave the sugar in the sweet tea ratio up to the reader. I feel like however you like your sweet tea is how you’ll like your sweet tea fried chicken. If it were me, I would put 3 tablespoons of sugar into 1 1/2 cup of tea before boiling it down. Taste your sweet tea before boiling it down to make sure it’s to your liking. Then boil away. The recipe calls for 1/2 cup of sweet tea concentrate, so boil it down until you have 1/2 cup. Made this tonight and it was INCREDIBLE! We don’t drink really sweet tea so I used an Honest Tea Assam Black Tea and boiled it down. I did add a couple of my favorite spices to the flour mix, but otherwise, followed the recipe to the letter. The chicken was really juicy, too boot. I’ve always been leery of frying chicken before, but never again. Thanks so much! Christina, We made the chicken last night and it was wonderful… moist inside with crispy skin outside… just like you said. What a southern fried chicken recipe! We served mashed potatoes with gravy and sweet corn-on-the-cob with it and we were in ‘Texas Heaven’ – LOL! 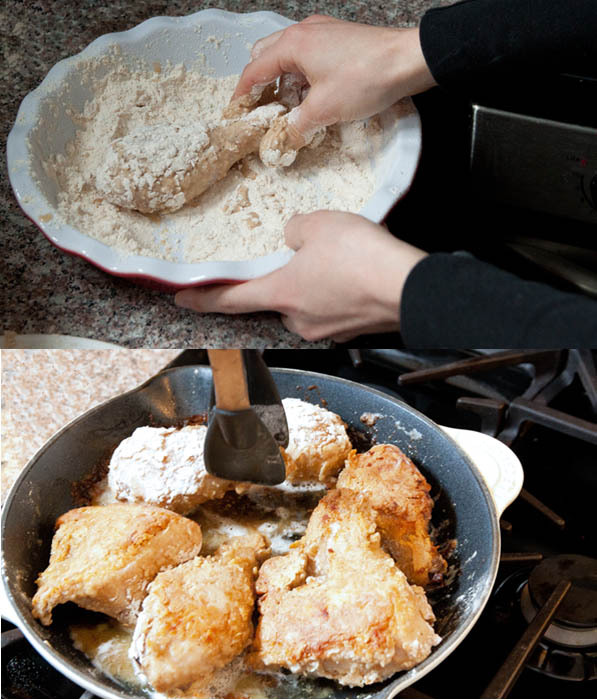 I made the sweet-tea fried chicken and it looks just like the photos on the blog. My husband and I found it a bit sweet for our tastes. And I am a sugar addict! I would probably use only 1/4c. tea concentrate and many dashes of hot sauce to the marinade as a counterpoint to the sweetness. I am a native Dallasite and have eaten my fair share of fried chicken, the best being my grandmothers’s of course. But she put a cut up yellow onion in the oil and it added an undefinable touch that made her fried chicken perfection. P.S. I bought Luzianne Sweet Tea concentrate in a 2 oz. foil packet on the tea/coffee isle at Walmart Supercenter in Plano,TX. for 98 cents. And though it was sweet, we did enjoy the chicken and the ease of oven frying. I also made the blueberry cobbler which was a major hit with my husband. Thank you. Hi there ! J7stvtried the recipe its amazing ! Thank u. Just one question …my oven roof ..floor everythings full of oily butter drops not coming off..how do u guys clean the oven after making this? Plz i want to make it again hut not gave an oven to scrub hard…anytips? For buttermilk, you say, “use the real thing.” Does this mean you churn your own butter, too or, are you saying to use supermarket buttermilk rather than a mixture of milk and lemon juice? Been a long time since I churned butter. Looking forward to trying this great recipe! Can this be made with grapeseed oil? Sure, just double check the smoke point of your oil before frying. I have never fried before, so I’m not quite sure what that means! =( I know that grapeseed oil is said to have a high smoke point, like olive oil. I am literally the worst at frying things. I usually leave that up to my husband, even though I do like 95% of the rest of our cooking. I am totally game to try this soon. I’m on a mission to connect with our families’ southern roots and soul food heritage – and maybe oven fried is the strategy I need. Thanks! I’m not sure, Shelby. Just keep an eye on it and lower the heat if it threatens to burn. Copper is a great conductor of heat, just like cast iron. Not so much..it’s just a tenderizer. OMG, heaven on a plate! And its easy to make, too. Thanks, Christina!